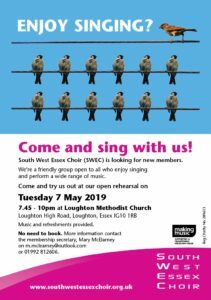 South West Essex Choir (SWEC for short) is a large, friendly and non-auditioned choir with a membership of over 100 people mainly from Redbridge, Waltham Forest and South Essex. If you enjoy singing – even if you’ve not been in a choir for a while – why not come and sing with us? We’re a friendly bunch with singers ranging from the complete beginners to very experienced. Everyone is very welcome! Visit the join us page to find out more. We’re holding an open evening on Tuesday 7 May 2019 for prospective members to try us out. No need to book, just turn up! We’re hosting a Choral workshop on Saturday 11 May 10am – 3pm at Holy Trinity Church, South Woodford. The workshop will be led by Marc Yarrow, a well-known experienced singer, vocal coach and choir conductor. The workhop will focus on vocal technique and we will work on several choruses from Karl Jenkins’ The Armed Man. It costs £15 to take part. Email southwestessexchoir@hotmail.com for more information and to register. Our next concert is on Saturday 6 July 2019 at Chingford Parish Church when we shall sing Haydn’s The Creation. Tickets will be on sale here soon.